People struggle to play in the wind because they take the wrong approach to the conditions. Most folk try to hit it harder but, if you do that, you’re actually only going to put more spin on the ball. The problem with that is that the wind exaggerates the spin on the ball even more. If I had a lot of leverage in my swing here, the clubhead would be behind my head. There is no way I would be able to turn slightly and point to my clubhead like I can when reducing the leverage in my swing. 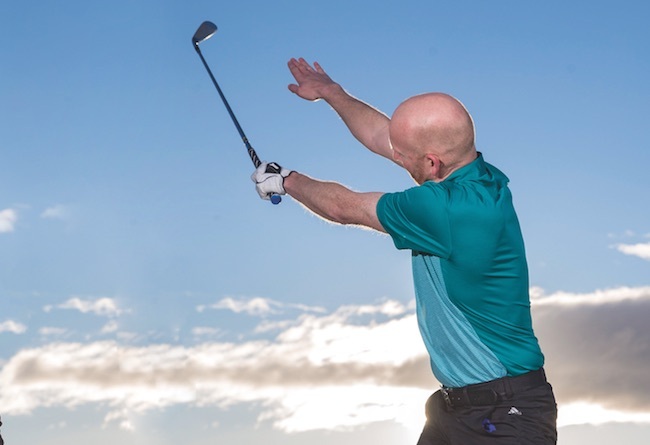 That’s the difference in the wind, you want to keep your left arm straight to create width as it forces you to reduce the leverage and the length of swing, resulting in better control. By reducing the leverage, you reduce the loft at impact. 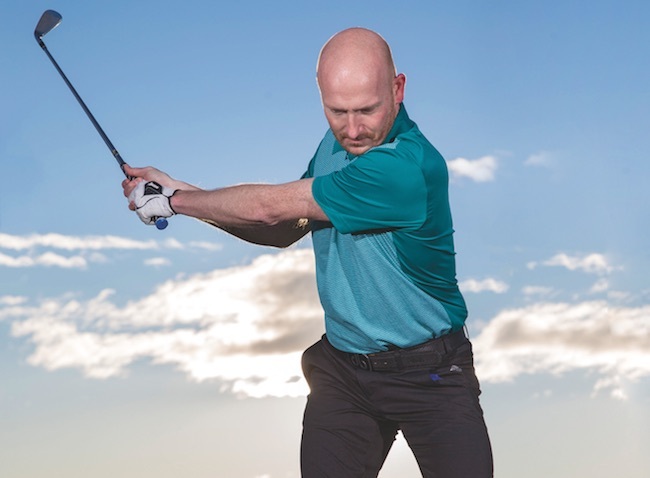 The more of an ‘L’ shape you can get in your swing (between left arm and shaft), the more loft you’ll put on the club, which is perfect for a flop shot, or something along those lines. 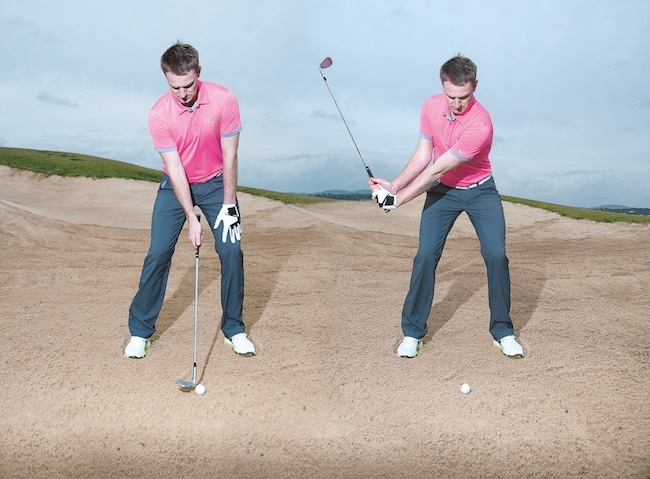 But if you want to keep the ball low, under the wind, you need to know how to control it. If you reduce the loft, you’ll instantly gain more control in windy conditions. You want to take more club in the wind as opposed to hitting the ball harder. I’ll sometimes take my 5-iron when the required distance in normal conditions is only my 7-iron. But I want full control of the shot minus the loft and spin. It’s almost like you’re hitting a really long, aggressive putt. Zach Johnson won the Open last year at St Andrews with that kind of swing and it’s a very useful skill to have in your armoury. 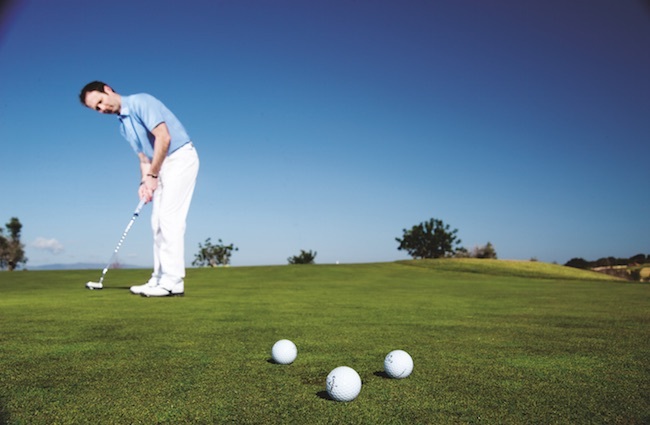 There isn’t anything really drastic that you need to do to your swing to play in the wind. Just think about being ‘short back and through’ – that’s the key point. Your follow-through should be curtailed. 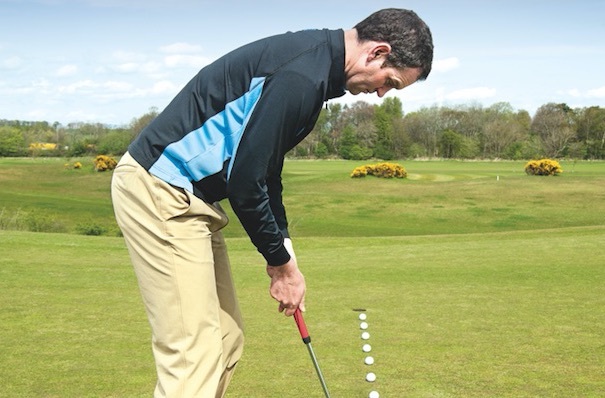 Anything shorter than your normal follow-through will be of massive benefit to you. Just remember that the higher you follow through, the higher your ball flight will be. I like to feel as though I’m quite straight to the target line on my follow-through, a little more punchy. Steve Johnston is the Head Professional at Peebles Golf Club. For lessons, call Steve on 01721 720197. Follow Steve on Twitter @sjohnstonpga and you can also subscribe to his YouTube channel ‘Steve Johnston PGA’. Originally published on bunkered on November 16, 2016.